Rent The Shiloh | Corporate Events | Wedding Locations, Event Spaces and Party Venues. Accommodations for 30-450 in each of our two rooms, On-Premise or Carry Out Catering Services, Home-Style Cuisine cooked on-site, Decoration & Coordination Services, Entertainment Resources, Cakery Service, Complete Bar Service as well as the AnnaLynn Garden for picture perfect wedding ceremonies. Facility rental is for a five-hour duration and includes table and chair setup, teardown and complete janitorial services. 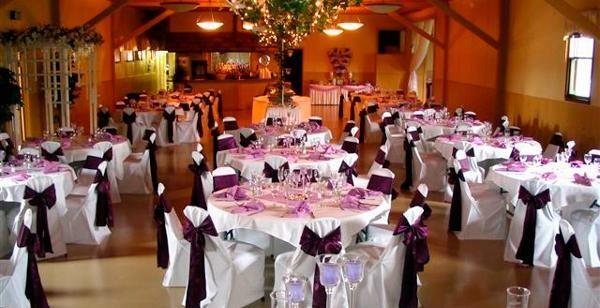 Each banquet wing at The Shiloh is licensed up to 450 seated guests, however, we may limit capacity based on the event and catering needs requested. In the event your anticipated guest count exceeds each wing’s capacity, we have the ability to adjoin both rooms to accommodate up to 900 guests seated. Please contact management for a quotation if rental duration is different or if both wings are required. Annalynn Garden is a unique and natural outdoor landscape consisting of several water features, botanicals and other natural amenities. The garden is truly a ‘work in progress’ as we commit to add plants and features regularly to enhance its appeal. We built the garden with special weddings and cocktail parties in mind! The stamped concrete patio will accommodate up to 185 chairs while even more can be seated in the lawn. If the weather becomes an issue, we can often move the entire event indoors with little to no interruption or inconvenience to the scheduled event.